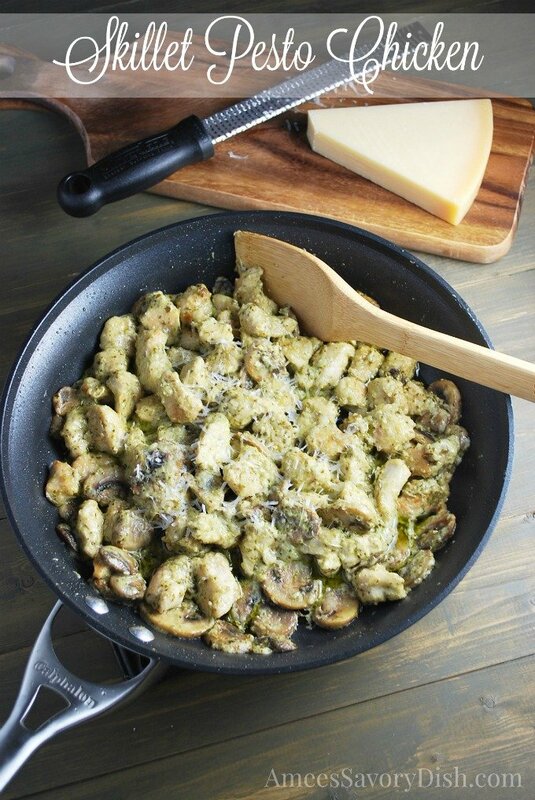 This Skillet Pesto Chicken is one of those fly by the seat of my pants dinners, where I was using up things that I had in the fridge. I love fridge dump day, it’s seriously therapeutic to use up what you have on hand and have it turn out to be a pretty darn tasty meal. I’m kind of obsessed with homemade pesto. I like to make it fresh in the summer when I have basil coming out of my eyeballs. However, my harvest is over and it’s expensive to buy fresh basil and all of the separate ingredients, so then I cheat and buy it. If you’re a purist, you should try my homemade pesto recipe. It’s so good and easy! There are a lot of tasty pre-made pestos out there, just check the label ingredients for a minimal amount of ingredients. It should contain olive oil, basil, garlic, nuts and sometimes cheese but not many other ingredients. 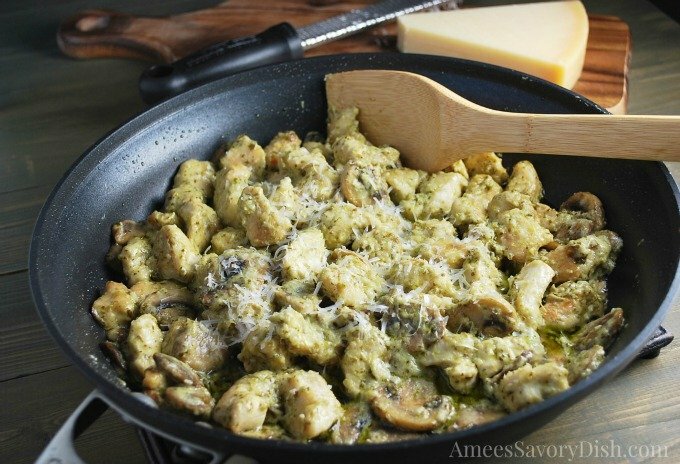 This Skillet Pesto Chicken is a new weeknight favorite. It’s great all by itself with a heaping side of green vegetables or serve it on top of whole grain pasta or brown rice. Add chicken, chicken broth, cream and pesto to pan and stir to combine. Cook for a few minutes more until sauce has started to thicken. Send us your recipe for pesto sauce. Hi Mary Anne! Click on the highlighted “homemade pesto recipe” text in the post and it will take you directly to my recipe. A LOVE a good kitchen dump day… Had one today as well! It is always best when you can create something tasty like this! Wow!!! I made this for dinner, and it was awesome! Even our picky kids loved it! Paired it with garlic/rosemary oven roasted potatoes, and carrots. But the pesto chicken was definitely the Star! Thank you for posting this recipe.